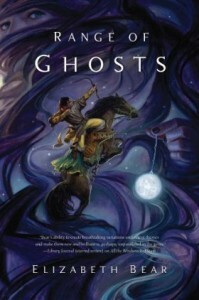 Range of Ghosts is the first book in Eternal Sky, a new epic fantasy trilogy by Elizabeth Bear. It will be available in March 2012. This is a book I’d read just because it’s by Elizabeth Bear. I love her books – they’re not always the easiest books to read since she has a tendency to throw you in without all the details but they are beautifully written, intelligent books. They also often use a lot of different mythologies, which I’m also drawn to. The Sea Thy Mistress by her is one of my favorites from this year. Since preparing this post, I have gotten an electronic copy to read from the author, and I couldn’t resist looking at the opening pages. The writing is just as lovely as I expected. Now I’m eager to get a chance to finish reading it! I don’t generally read a lot of ebooks since I just don’t have as much fun reading them, but I will read this any way I can. It’s one of those books I’d read even if my copy was handwritten on napkins.